Marketing Funnels for my business." - Select - Google/Search Engine Facebook DM Lab Group The Machine Group Linked In Joomla Extensions Directory Other Please select how you heard about us. 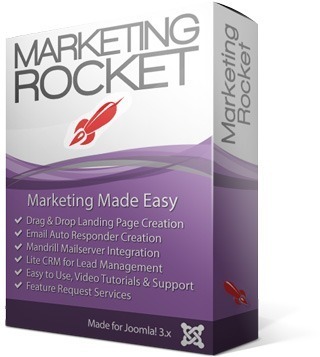 Marketing Rocket has revolutionized my business. Not so long ago I was spending upwards of $20,000 per month in alternative advertising and telemarketing, ever since we started with Marketing Rocket I get more leads every week, at a small fraction of the cost. I'm thrilled, my leads are higher quality and sales are through the roof! We launched a campaign on Marketing Rocket just a couple months ago, not being a techy, I was very concerned about the technical side of setting it up, but a quick run through the video help and I was up and running, now I'm getting regular sales and leads online, and Marketing Rocket has already paid for itself 100 times over!